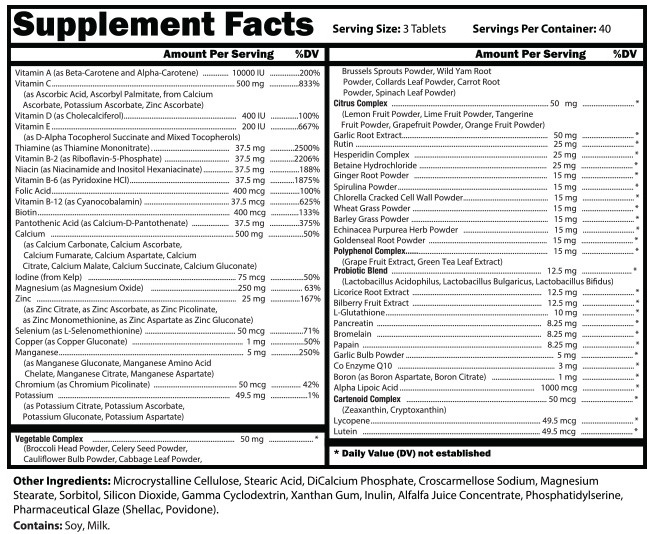 MultiElite By CTD Sports, 120 Tabs at SameDaySupplements.com® for lowest price. What Is CTD Sports MultiElite? MultiElite contains the highest level of antioxidants, vitamins, minerals, phyto nutrients and digestive enzymes. MultiElite is a time released whole food based multivitamin and mineral packed with antioxidants, digestive enzymes and phyto nutrients. What's In CTD Sports MultiElite? How Do I Take CTD Sports MultiElite? As a dietary supplement, take 3 tablets of MultiElite daily before a meal. If you have never taken bee products, please start with a small serving per day and increase gradually in order to assess whether you are allergic. If you are taking any medications or have any health conditions, consult a physician beforehand. We have a large selection of in-stock CTD Labs products including Multi Vitamins items and others for the lowest prices at SameDaySupplements.com® It's always easy to shop for MultiElite By CTD Sports, 120 Tabs at SameDaySupplements.com because you can browse by reviews, brand, prices or search for specific ingredients using our search tool. In-stock orders placed before 3pm EST ship out the same day to USA, Brazil, United Kingdom, Canada, Germany, Australia, Japan, India, France and worldwide at the cheapest prices online.